Release is not the final stage of working on the project. At that moment, continuous work on application support and improvement starts. If you neglect it, chances are that the users will lose interest in your product rather quickly. Keeping clients engaged is a difficult but not impossible task. It is achieved by different methods and techniques. Apps update is one of them. It is widely regarded as a significant part of app promotion. Still, you should apply them carefully in order not to frighten away users with changes too often. 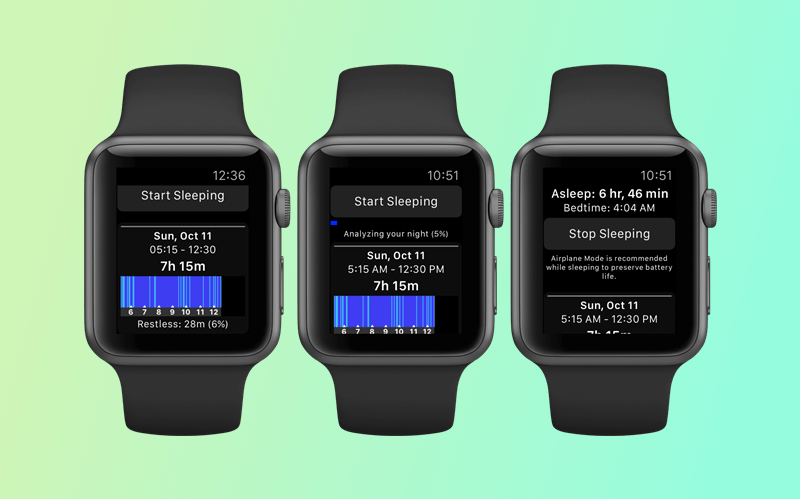 Further, I propose to dive deeper into the subject and learn more about how to update your apps wisely as well as how to strike the right balance of their release frequency. First of all, let's find out exactly what concept an application update involves. Usually, it covers two types of changes: bug fixes and the introduction of new features. This is the most common reason for apps to be updated. The developers implement bug fixes when it is necessary to eliminate any problems with the application's functionality. This kind of all apps update does not change the app structure and does not bring any innovations. It aims to make the app work just the way it was meant from the very beginning. Bug fixes are impossible to avoid because no beta testers or QA engineers can detect all the issues which may occur during app usage. Only when you release the app and it goes into widespread use, the nontypical scenarios of user behavior reveals certain errors. Bug fixes maintain the integrity of the app structure. They make sure the application does not crash, freeze, get stuck, or do any other things beyond functioning normally. 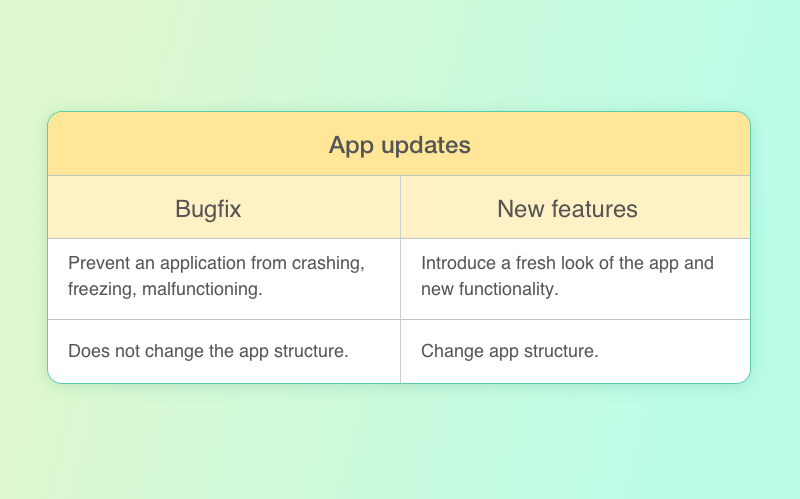 Introducing new features is a significant event in the app's lifecycle. Probably, it is even more important than bug fixing. Such new updated apps aim to bring new experiences to your customers. When adding new functionality, it is reasonable to check the customers' feedback and reviews. Often, they share great ideas. If you see that a particular option has a lot of votes and positive comments, you should give thought to implement it. Don't forget that the change of functionality is not always driven by adding features. Case when certain options are removed from the app are not rare in the development practice. It usually happens when the feature is not as in-demand as was expected or when it works poorly and there is no technical capability to fix it. There are times when some options may have an adverse effect on other features or the app's functionality in whole. It is also a big reason to completely remove it from the app. What is an app version? You must have noticed that each app has a small write-up about the current version available in the App Store or Google Play. Usually, it consists of three numbers. Each number indicates a certain type of changes made in the application at any given time. Thus, the app version is a new representation of the current product in the light of certain amendments and improvements. Each subsequent number shows the less important changes to the app. The first number covers major changes to the user interface or functionality. The second number refers to the changes of the average importance, like adding or removing some features or fixing important bugs. The third number stands for minor alterations, elimination of small issues, and revisions. A perfect example of the major change is latest version of JIRA. Starting with the version 7, they have altered the name. Now it is JIRA Software. It is pretty similar to what was known as JIRA but together with the installed plugin Agile. Now, this plugin is a part of the basic configuration which is called JIRA Software. There is also JIRA Core - it is a former clean JIRA without the Agile component. The following versions of JIRA Software (7.1.x, 7.2.x, etc) do not make radical changes to the software functionality. They just removed inaccuracies in the existing options. For example, the version 7.1.6 contains an update to JIRA analytics. How to update apps on iPhone or Android-based device? First of all, the frequency of Apple and Google apps update directly depends on the specifics of your product, target audience, and professional skills of the development team. There is no correct or incorrect schedule for rolling in the innovations or fixing the issues. However, there are some external factors that you should bear in mind. It concerns the time of application processing in an app store. From this perspective, Google Play is more loyal. So, how to update apps on Android? Even though its verification process is not totally automatic like it was earlier and an app passes through the examination of live experts, usually, it does not take longer than a few hours to receive an approval or rejection. In the event of a refusal, Google indicates the reasons of why the app was rejected or suspended. Another question is how to update iOS apps? The situation is rather different with the Apple App Store. Even though their official site claims the average time for app reviewing is 24 hours, the experience shows that this period may last up to several days. It is worth mentioning that you can ask for an expedited app review in case you need to urgently submit a critical bug fix or intend to introduce the latest version at a time-sensitive event. Note that Apple reserves the right to decline your request. Do users need to update installed apps each time I make changes? The short answer is No. Remember, that a mobile application usually consists of two sides: server and client. When you make any changes to the functionality implemented on the server, they are automatically put on each client's app installed on the devices of your users. It means that no approvals are needed from Google Play or iTunes to update installed apps and no actions are required from users to apply the changes. As a rule, server updates for apps have a separate numbering and are available for viewing in the release notes of the app. If you want to prevent your users from manually updating the client's app, you can adjust it so that all the updates run automatically. Be careful when making such decision as it may lead to the customer disturbance. For instance, if the new version will occupy more space on a device, you'd better ask users whether they accept it. How can I promote my app using App Store and Google Play Store app updates? The term 'promotion' refers to a set of marketing activities that aim to increase the portion of product, service, brand, or company on the market. The reasonable frequency of iOS and Android app updates shows that you are constantly working to improve your product. You'd better not keep this fact quiet. Rather, you should use all means to inform current and potential users of the positive changes. Here is how you can do it. Starting from iOS version 6, the 'What's new' part in the App Store has become not less important than the "Description" section . On iPad, it appears automatically on the updates screen. On iPhone, you can reach it in one click. Just as you use the description to advertise your app, deploy the 'What's new' section to tell about recent improvements and upgrades. Be creative. Don't limit yourself to just 'Features added' or 'Bugs fixed'. Use live language to tell people about great innovations that are going to propel them to the next level of user experience. By mass media, I mean all the possible blogs, social networks, and other sources that you can use to tell people about the major updates. Be careful not to step over the line though. Minor fixes are not worth mentioning. You should only generate such pizzazz in the case of large changes that will be clearly visible to your customers. By the way, if you have an idea of creating social media app on your mind, our recent blog post is a must-read. Consider also alerting the users by means of push notification or a pop-up that appears when the app opens after the update. Make sure your messages do not spam the users. Carefully filter the news that would appear in such a way. Don't hide the perspectives of the upcoming improvements. Advertise updates for apps at least two-three weeks before the planned release. Tell exactly what you are going to add, change, or upgrade. Describe in details how a particular option or a whole app is going to work. List the obvious benefits for your customers. Mention some drawbacks that are going to disappear. Remember that you can apply the tactics above only if you are completely sure that the new version will come in time. Giving empty promises is much worse than not giving them at all. Of course, anything can happen. No one would blame you for a small delay that happens once in awhile. However, if you constantly postpone the promised release, you risk gaining the reputation of an incompetent developer. You must have heard of promo codes provided by both Apple and Google to developers upon request. These promo codes are pegged to a certain release and platform and have limited availability. They can be used for trying a paid app for free by making an in-app purchase without spending real money. You can use these promo codes to let some users try your app before it goes into production. For example, you may contact well-known bloggers who are interested in writing a review for your app. If some of them gave a negative feedback in previous posts, you can use this opportunity to improve your reputation. What are the best practices to update apps? Do it only in case you have something new to show. Redesigned user interface or the new look of app features are a big reason to display the upcoming changes. Added functionality and early non-existent options are also worth being screenshoted. Don't forget to show how your app is going to look on different devices. At the same time, do not update your screens if you've fixed any minor issues or critical bugs (even if you are very proud of it). Such improvements do not pay to get visually represented since they do not change the general look of your app. Broadly speaking, metadata is the data about data. 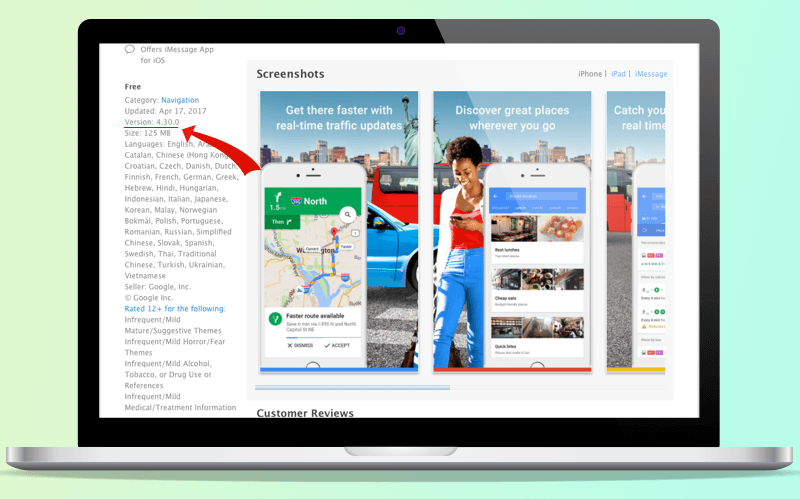 When releasing a new version, it describes the information about the app. The mobile application metadata includes versions and build numbers, titles, icons, required permissions, support information, etc. With each new version, you must update its number. All the other metadata can be updated at will. I would recommend to replace or modify an icon if you have a major app upgrade, though. This is the most recognizable element that is associated with your brand. Its fresh look will let users know that great changes are to come. No matter if you made a great improvement or just a tiny fix, make sure that your users get to know about it and how to upgrade an app. Write the text in a simple and understandable manner. Make sure your customers feel valued and involved. Do you know how to write a perfect app description? We have some useful advice you probably haven't heard of. When writing, feel free to say that the annoying bug was finally fixed and the highly rated feature was successfully implemented. You can also mention some future plans and give a hint of the planned options and improvements that are to come in the next versions. Don't delve into technical details. Use a relaxed manner of presentation. Your clients don't want to know how many lines of code you wrote or how many hours you spent for testing. They are much more interested in a final result and the practical use of your efforts. Mobile apps update makes a large portion of mobile app development and promotion. They are needed not only for fixing bugs and issues polishing. Periodic updates show that you have gained efficiency of your product and do care about your customers. There is no a universal recipe of how often you need to update your app and what exactly you should do. However, don't forget that properly compiled descriptions and timely placed information may give excellent results. If you need a professional team that can implement a great app and support it after the release, feel free to contact us. We have a vast experience in app development and maintenance. Happy app-ing! We have a lot more information to share with you. If you don't want to miss anything, subscribe to our blog and receive fresh articles right on your email.